Guess what. I’m going to save all of you brides-to-be about fifty bucks. Yeah, that’s right. Being crafty can save you so much money for your wedding! Trust me. Over the next month or so as my anniversary nears, I’m going to be posting all of the fantastic ideas and decorations I made and the money saving tips I’ve compiled. Instead of being in elementary school, I was getting married and I didn’t think that a shoe box with a hole in the top was acceptable. My mom and I did some digging on Pinterest after realizing a cute card box costs about $50 and made a run to the craft store (for the thousandth time.) We bought a plain cardboard circular box, some scrapbooking floral decorations and a small wooden letter. 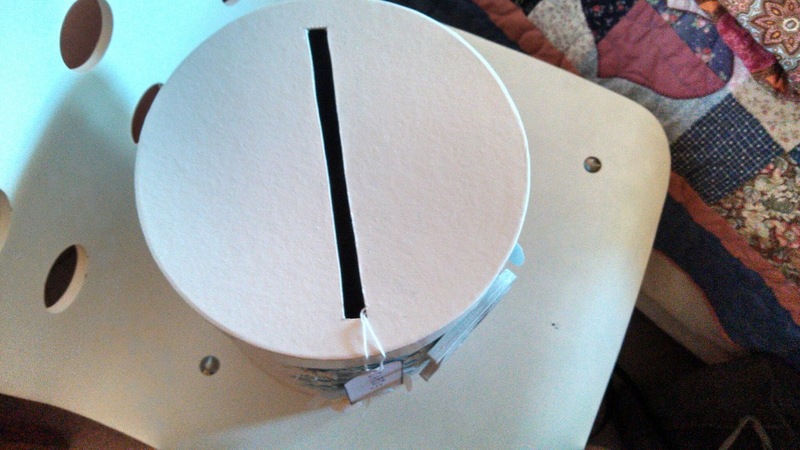 We cut a hole in the top with a very sharp exacto knife and painted the whole box white. 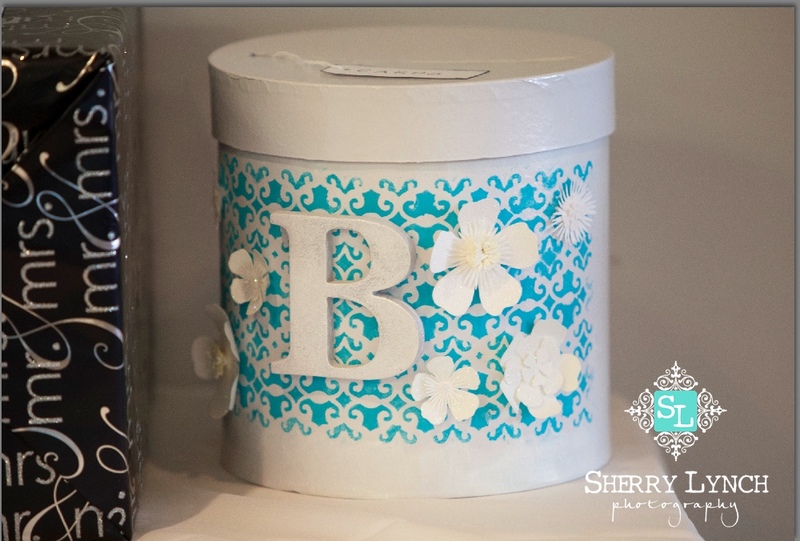 I then took a stencil and wrapped it around the box and painted it in our wedding color. I then painted the wooden letter and sprayed it down with glitter spray paint. Yes, it does exist! I positioned the letter where I wanted then placed the flowers around it. To make sure that people knew what to do with it, I cut out a tag from paper then stamped the word “CARDS” on it, tied a string to it and taped it neatly from the inside of the hole on the top. It worked magnificently! It was so easy to just carry out the box after the wedding instead of worrying about grabbing all the cards. Another helpful hint from my wedding planner: designate someone to be in charge of the gifts. Have them take gifts that come with cards and tape the card to the box so nothing gets mixed up! It makes writing thank you cards so much easier. 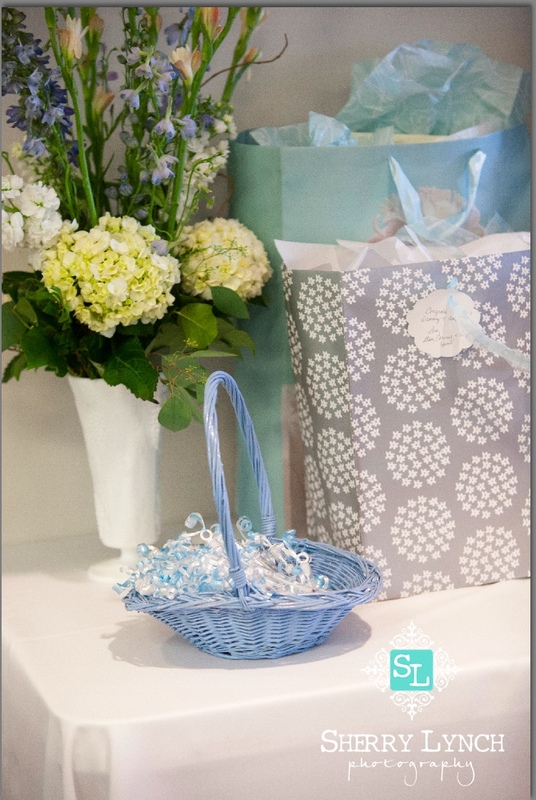 Here are two pictures that my amazing photographer, Sherry Lynch took of our gift table!